The patterns in this ebook are also available separately, see each pattern for details. Playful Citrus is also available as part of the ebook Spirited and Playful Citrus. Flirty Berberis is nearly seamless and is worked sideways. The bodice is made first. While the sleeves are worked in the round, the front and back are shaped and knit flat. There is minimal sewing involved at the underarms. 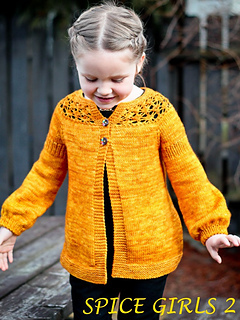 Flirty Berberis can be made as a shrug or as a full length cardigan; make it with short sleeves or long sleeves, simple neckband or ruffled neckband. The style is for you to decide. Flirty Berberis will surely delight you as a knitter and your special girls who will love to wear it! Flirty Berberis is designed for DK weight yarns and is sized from 6 months to 14 years. My Honey is a top down yoke and raglan construction and features some simple lace, bell sleeves, and an optional decorative bow. My Honey is designed for DK weight yarns and fits children aged 6 months to 14 years. 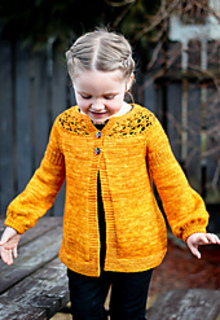 Playful Citrus has a top-down raglan construction with some interesting shaping. Playful Citrus is designed for 2-ply/laceweight yarns and fits children aged 6 months to 14 years. Silversage has a top-down contiguous sleeve construction and is completely seamless. 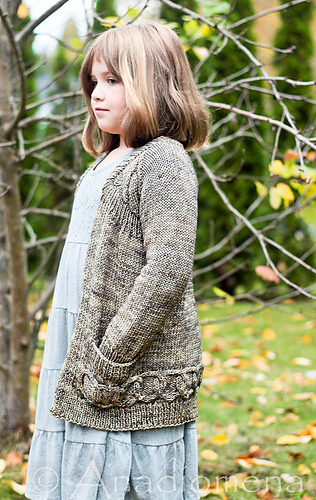 Silversage is designed for DK weight yarns and fits children aged newborn to 14 years. 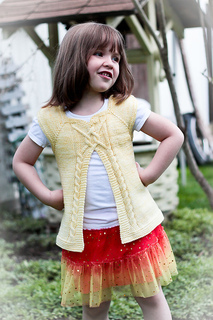 Wild Vanilla is a top down seamless vest designed for DK weight yarns and will fit children aged 9 months to 14 years. Spun Sugar is a gorgeous, elegant, and very girly design. It has a modified top down raglan construction and features simple (or not simple) cables. The garment’s length is very easy to customize. 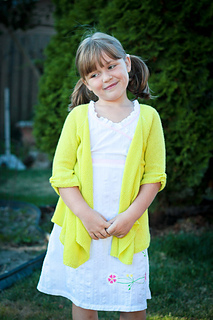 This cardigan can be made with long or short sleeves. Spun Sugar is designed for worsted/aran weight yarns and fits children aged 12 months to 14 years. To see more designs by Elena Nodel click here.